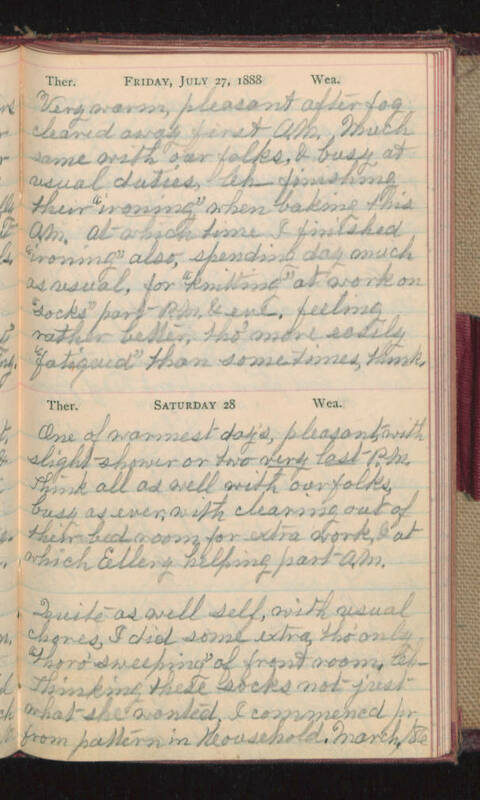 Friday, July 27, 1888 Very warm, pleasant after fog cleared away first A.M. Much same with our folks, & busy at usual duties. Ch- finishing their "ironing" when baking this A.M. at which time I finished "ironing" also, spending day much as usual, for "knitting" at work on "socks" part P.M. & eve. feeling rather better, tho' more easily "fatigued" than sometimes, think. Saturday 28 One of warmest day's, pleasant, with slight shower or two very last P.M. think all as well with our folks, busy as ever, with cleaning out of their bed room for extra work, & at which Ellery helping part A.M. Quite as well self, with usual chores, I did some extra tho' only "thoro' sweeping" of front room. Ch- thinking these socks not just what she wanted. I commencd pr from pattern in Household. March/86.